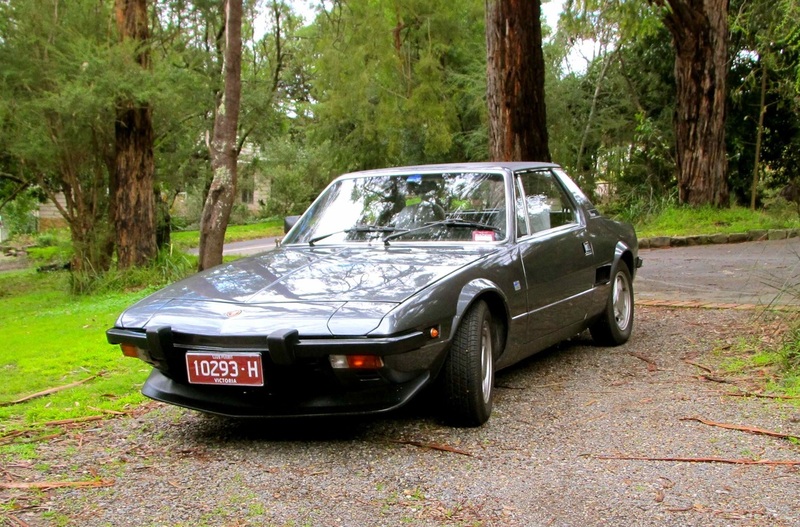 In 1982, Peter was presented with a truly rare opportunity when a Fiat 124 Vignale came up for sale through his Fiat club in Melbourne. There are also photos below on other cars that Peter owns. The famous Italian coachbuilding firm Vignale rose to prominence as Italy found its feet post-WW2. Its founder Alfredo Vignale first gained fame when he designed his own body for Fiat’s diminutive 500 chassis in 1948. The vehicle was so well received that he was flooded with requests for similar designs and from that year, Carrozzeria Vignale was much in demand. Over the years, with young designer Giovanni Michelloti learning the ropes on the team, Vignale developed its portfolio, briefly becoming Ferrari’s coachbuilder of choice in the mid-fifties. Maserati commissioned the company to produce the sensational 3500GT Spider. Several Lancia chassis sported a Vignale body option. Various one-off cars were designed, notably a glamorous version of an As﻿ton Martin DB2 for King Boudouin of Belgium in the 1950s. They also penned the Jensen Interceptor in the 1960s. Throughout this time, the links to Fiat continued. Some versions of the 8V were particularly striking, but it was the smaller machines that allowed Vignale to mass-produce its own Vignale-Fiats from the firm’s factory in Turin. The 500-based Gamine, often referred to as the ‘Noddy Car’ is probably the best known, but vehicles based on 600 and 850 floorpans also went into production. As the sixties drew on, our featured car, the 124 Eveline, was released alongside the 125 Samantha. “Total production of the Eveline was around 400, most of them in right hand drive for a Greek-Cypriot casino owner, who had the distribution rights for the UK,” the Eveline’s owner Peter Bartold explained to me. The story goes that, on a chance visit to Milan, Frixos Demitriou came across a Gamine. He later went back to visit the factory and offered to buy 200 of the company’s cars, configured in right hand drive, upfront for resale in the UK. A mixture of Gamines, 850s, 124 Evelines and 125 Samanthas were subsequently built and shipped. But, in the end, unimpressive build quality, with high prices asked for performance offered, caused the venture to fail and a fleet of unsold cars followed Demitriou back to Cyprus. In 1970, Demitriou died under bizarre circumstances when an army tank ran over his Vignale-Fiat – while he was still inside. The incident followed Alfredo Vignale’s own passing, also in a Vignale-Fiat, in 1969 just three days after he had sold the Vignale factory to De Tomaso, preparing their Ghia bodied Pantera for production. By 1982, after owning several Fiat models including a highly modified 128 turbo, Peter heard news of the Eveline. “A friend from the Fiat Car Club, where both Lyn and I are life members, called to say there was a 124 Vignale for sale. I had read about Vignale and seen the 124 Eveline on the cover of Sports Car World in the ‘70s, I knew of its significance. I also rang around the club to let several potentially interested people know, but there seemed to be no takers. In the end I bought it for myself!” he said with obvious pride. After inspecting the car, Peter found it was in a sorry state. He described its condition as he led me around his spacious garage area. “Both the original 1.1-litre pushrod engine and interior were basically irrecoverable.” Sharing garage space with the Eveline is the daily driver, an Alfa 164 ‘tow-car’, and his racing Fiat X1-9. On slicks, the race car’s stance is pure aggression. “You would not believe the weight you can get out of these!” he said, displaying the home-adapted Motec fuel injection system to be installed into the club racer. We strolled through the rear door, past another car port, and another X1-9. Essentially gutted, this machine is Peter’s latest project, its flared bodywork indicating something special. “Dallara, the engineering company, built a couple like this back in the day, and we are taking the time to make it look the same.” To the right is the ‘road’ X1-9 – do you find a theme emerging? – in regal dark blue, and a Peugeot 306 convertible that was due to make way for a new Fiat 500, one of the cars for use at the AGP, although not raced. The purpose of our stroll became apparent when, in the parts shed, Peter pulled out the Vignale’s original, decayed interior seats and trim. “Fortunately, we have an industrial sewing machine so Lyn can do a lot of the interior trimming at home, but the seats will need more work.” Peter also did all the re-wiring for the dash in 2006, when he had a wood grain-style dashboard crafted to replace the old, decaying dash. Subtle details of the Vignale design reveal themselves. 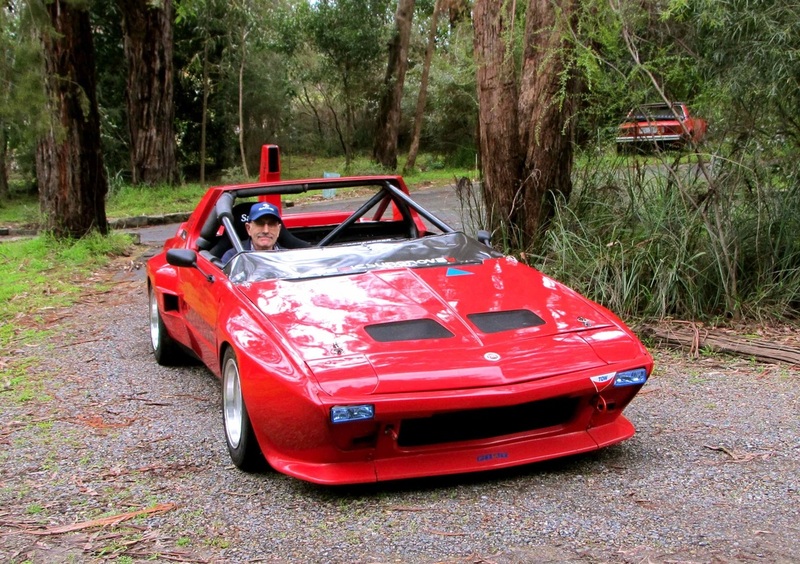 “The car was quite advanced for the time, with the 4-wheel disc brakes. Mine also has power windows, a rear demister, and a remote boot release situated in the driver’s door jamb.” Other extras like the refined interior lighting, a wonderfully elegant wood rim steering wheel and contoured console in the rear “providing armchair seating for 4,” according to the UK brochures of the time, all contribute to making the Vignale a special place to be. Externally, the front Fiat badging is apparently unique to these vehicles. Peter hasn’t seen a similar example on any other Fiat. He has had ‘Eveline’ badges made for the car and even gone to the trouble of fitting an Italian-style rear number plate for display. Detail is important, but standing back, you can better drink in the understated elegance of the Vignale’s silhouette. Peter has had the car repainted twice. Originally metallic blue, the boldness of the current fiery red is offset by the gleam of the Borrani wire wheels. The bumpers also required some TLC, the front proved reusable after re-chroming, but the rear was past salvaging. “I left the bumpers at the shop while I figured out what to do. When I called up a couple of months later, they had thrown the rear in a skip.” In the end, a 124 coupé rear bumper was cut down and used. “You’d only see a change in contour if you were told about it,” Peter beamed. Having driven around 4,000 well-maintained kilometres in Peter’s hands since he acquired it, the distinctive coupé feels eager to please from the moment the twin-cam catches ignition, and settles down to a talkative, bubbly idle. “A little louder than normal at the moment, the muffler must finally be getting old!” laughed Peter. As the car warmed up, Peter talked me through the controls, pointing out the relocated power window switches and wiper function which was necessary on the day of our drive. A short distance down the road, he handed me the keys. My first impression centred on the Italian driving position, combining offset pedals with a seating location more suitable for those with short legs and long arms. Once adjusted, the controls are light and sensitive to touch, particularly the manual steering, which is responsive through that gorgeous wheel, yet requires little effort even at parking speeds. The 4-speed gearbox snicks positively through the gears with a lovely mechanical feel, and a lively engine note. The short gearing matches well with the 125 Special motor. Even the all-wheel disc brakes, a novelty in the sixties, are progressive and bite better than expected. On the topic of handling, Peter is thoughtful. “I don’t look at it for handling, or performance. That’s what the race X1-9 is for. The Vignale is a nice cruiser. We love to take it to club events and our daughter used it as her wedding car a few years ago.” Its ‘cruising’ feeling is felt throughout the driving experience as the light steering combines with compliant suspension to give relaxed progress. As we arrive back in the driveway, a final question lingers: Is there anything he would change on the car? “If you look around the front lights, you can see they are missing a chromed section that would frame them. I am thinking of making some up for it, and I think it would complete it. That, and the interior, returning it back to something more original.” It’s clear that with Peter’s passion and know-how, not to mention endless support from his fellow club members, the Vignale will continue to be pampered and sympathetically altered if required for many years to come. Written by Adam Davis. Photos taken by Cartalk in 2012. Contact: Peter Bartold on 0414 867 280 or by email vignale124@gmail.com regarding older Fiats. Other cars Peter owns includes two Fiats X1/9 and a current Abarth 500. Fiat world-wide also owns Alfa Romeo, Ferrari, Lancia and Maserati and has recently increased its stake in Chrysler to approximately 60%.